With its dank crypts, leathery flesh and febrile devotion to veiny gore, Vampire mythology has never particularly resonated that well with me. Of course, there are some notions cast within that world that have potential, but the central premise of an unchecked and inextinguishable compulsion for immortality, funneled through the bloodletting, rituals and orthodontically-driven violence of a chthonic race gets mostly a meh from me. I’m not haemophobic by any stretch, some healthy bloodsport is always called for, especially in the service of a good narrative. And there’s much to be said for the Gothic texture and lantern-burnt, Dickens-like zipcode of the settings that can often cradle tales of vampirism. Even the the idea of outcasts with superhuman power, excluded from daylight and humanity because of an irredeemable curse has much purchase. But for all that, its a sub-genre that I’ve mostly stayed away from. The densely accoutred universe of undead that writer and producer Joss Whedon crafted was an exception. In Buffy the Vampire Slayer and later spin-off Angel, Whedon did not take the narrative conventions as certainites and charted a series with a cast more befitting a teen 90210 drama than what might be common to the horror-derived genre. The television show exhibited an easy balance of self-mockery and pathos; mixing irony, acidic patter and characters that defied cheese and cliche. The misfit melancholy, character-based laughs, and all from within a unique supernatural world that offered enough whiplash commentary of our own, pitched the series above other fare. The last episode aired in 2003 but even before the shows hellmouth-collapsing finale, talk of an animated version has been around since earlier than 2002. 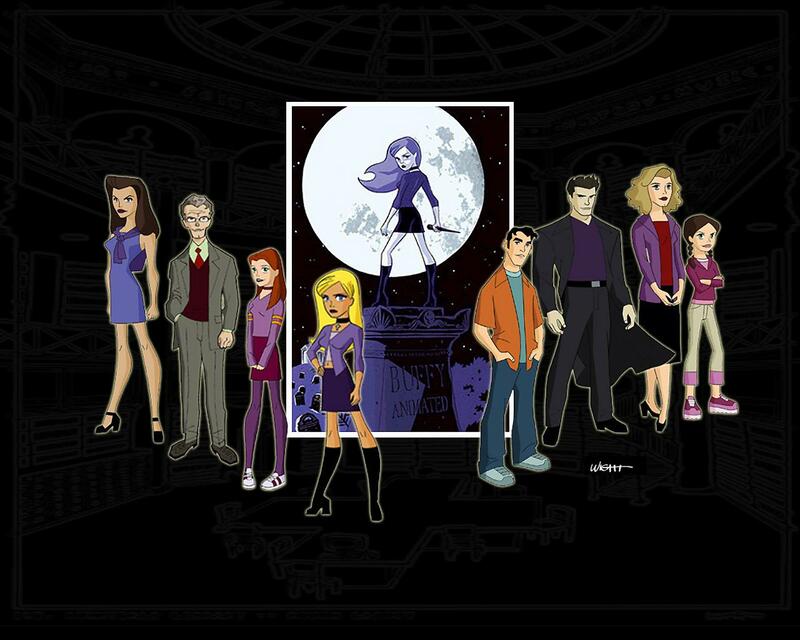 Buffy the Animated Series was to have a simpler starting point – set in the original shows season one (but with some “season seven point five” continuities, such as the inclusion of Dawn) – with less complicated backstories for wider audience appeal. With most of the original characters providing voices and artwork from Eric Wight – who had been involved in animation for the wickedly cool Batman cartoons – the concept seemed strong. The networks, however, were not as convinced. Despite the already cult status of the Buffyverse, the show has seemed to be trapped in a development purgatory. And talk of the show seem destined to remain nothing more substantial than the interweb EVP of over-caffineated Whedon fanbois. But no longer. Recently, an abridged version of the pilot was leaked onto Youtube and it’s worth eyeballing (for those interested, the three and a-half minute promotional pilot can also be downloaded in different formats on this page of the shows dedicated fansite). With petitions amassing and the attention of a sucessful Dr Horrible, Whedon and Jeph Loeb might be able to get this into full production. As old as the rebel, is the human tendency to create idols. And often within evangelicalism this can easily show itself in the cult of the celebrity. Whether it is an innate predilection to displace worship rightfully due our Creator or whether it is merely the enduring temptation to mirror the world, we can dangerously enthrone and celebritize leaders. Ignoring their faults and exaggerating their gifts, the public fall of a figure can therefore come as an even sharper dagger to the consciousness of that community. We should always expect genuine Christians to display fruits of the Spirit and an abundance of Christ-honouring work and therefore subject those who assume concrete roles within the church to greater scrutiny. But we should also acknowledge that there is only one faithful, unblemished high priest and true shepherd of the church; Christ. While simultaneously affirming the truth and social good of Christianity, the transforming power of the Gospel in individuals and societies, we also affirm that until the arrival of the perfect and justified church of the New Heavens and Earth, the contemporary church will be forever flawed and mangled by sin. Just as there is sin in corner stores and in real estate offices, so there is going to be sin in the church. Because, after all, people exist in the church. In fact, we might think that the church would have a higher concentration of brokenness, as people in need realise the nature of their condition and gravitate towards support and healing. We go astray when we think that the church is anything other than a wounded community gathered around the life-restoring power of our Saviour. The church is the bark of a tree, as Frederick von Hugel illustrated – we know there is no life in the bark. It is merely dead wood. We can only point others to the Spirit of Christ that animates within – the true sustaining life. As easy as it might seem to hew the descent of Christian leaders into a measuring stick of the truth of Christian ideas, we must resist the impulse. It is wrong to read the poor behaviour of the followers of Christ into the rightness or wrongness of who Christ was and the historicity of his life, death and teachings. As Augustine said, one must not judge a religion by its abuses. Of course, this does not permit us to ignore the tough issues that are raised in such circumstances. And with two Christian figures occupying attention in the last few weeks – for the wrong reasons- we should not pull away from such questions. Our test for every Lakeland that comes along should first be doctrinal and expositional. Is this awakening carried along by a “love for the truth” and a passion to hear the whole counsel of God proclaimed? McKamie also asked Osteen whether his family was used to getting special treatment, making reference to an anecdote in one of the pastor’s books in which he wrote about being allowed to take an expensive television camera onboard a flight to India even though it was against the rules. “You feel that you’re entitled to the favor of God … to do things other people can’t do,” McKamie said. “All of God’s children are,” Osteen said. This is the problem with the gospel that Osteen presents: it’s not the Gospel of the Bible. It’s a self-centered philosophy filtered through positive psychology and completely unmoored from what Christ taught. It knows nothing of the cross, of self-denial, or of bearing the reproach that fell on Christ. Sean Michael Lucas is right to raise the question John Piper presents in his book God is the Gospel (download the whole book for free on Piper’s website): does Osteen’s gospel delight more in the fact that God makes much of us or does his Gospel free us to make much of God? And any excuse to show this great Piper video, about the prosperity gospel, cannot be passed up. Photo taken in Hubei province in central China during the recent solar eclipse observed in central Asia. The shadow reached the earth first in northern Canada, traveled across Russia and Mongolia, and finally ended in western China (Google Maps traces its path here).